There’s no doubt that the defensive shotgun is an awesome weapon. A load of buckshot–or slug–placed properly will usually give the bad guy extremely celestial thoughts. We used to say that his case would be pled to a Higher Court. Unfortunately, few people ever go to the trouble to pattern test their shotguns and they haven’t a clue how their gun will perform at a given distance with a given load. When the shot leaves the barrel, it will function almost as a single projectile out to somewhere around 10 yards. Beyond that, the pellets will begin to spread and, at around 20 yards, some of the pellets will fail to stay on a man’s chest. Considering the fact that you are going to be held responsible for each and every pellet that leaves your shotgun muzzle, it might be a grand idea to do some pattern testing with various brands of buckshot loads. At the point that the buckshot won’t stay on a man’s chest, it might be a really good idea to transition to a shotgun slug. 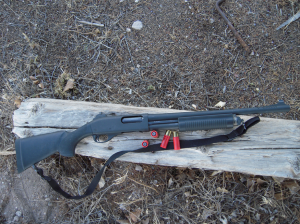 There’s a little trick to doing this quickly and efficiently with your pump shotgun. From Cruiser Ready (empty chamber & full magazine), it is necessary to create room in the magazine for your slug load. Step One is to rack the slide and chamber one of the buckshot rounds. Step Two is to load the slug round into the magazine. Step Three is to open the pump’s action by accessing the action-release lever, ejecting the buckshot load. Step Four is to close the action, thereby chambering the slug load. You are now ready to deliver the slug round downrange, should the bad guy still need attention. This technique is much faster and much more certain than trying to load and unload through the ejection port. Trying to work rounds in and out of the ejection port takes more time and will generally result in a double feed. The smart defensive shotgunner will get himself some dummy rounds (Brownells has them) and practice this technique several times in dry practice. In no time, it will become almost second nature and allow you to apply shotgun slugs to the defensive problem very quickly. Shotgun slugs, by the way, can be effectively delivered to a man-size target at surprising distances. This entry was posted in Guns, Personal Defense. Bookmark the permalink. I totaly agree with you about the use of shotgun slugs. Thet are devasting and capable of taking out dangerous game such as humans, lions , etc.,at up to 200 yards with the right set up. Great post. The shotgun is the most versatile defense weapon available in my opinion. For people that don’t have the budget for a high end carbine or are not willing to spend the time with a pistol, the shotgun is an excellent choice. It was in a shotgun class a few years ago that I discovered how versatile they are. The instructor had us engage a coyote size steel silhouette with slugs at 180 yards and most of the students were able to hit it with ease, even with just a bead front sight. I also suggest checking out Hornady’s Critical Defense 00 Buck. Using the Federal-designed ‘Versatite’ wad, it shoots tight, uniform patterns hitherto unknown with buckshot. Where are the shotgun dummies available from? Brownells lists a shotgun dummy but it is discontinued! I’ve been looking for a set of dummies (not snap caps) for a while. Brownells (see above), Remington, and Fiocchi all made them at one point but they are unavailable now.